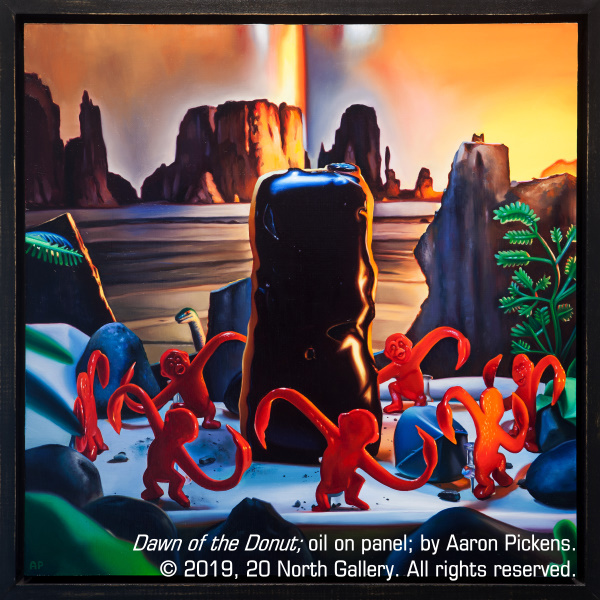 On Thursday, February 7, 6-9 p.m., 20 North Gallery is celebrating the narrative-based paintings of Aaron Pickens by inviting friends & fun-seekers, patrons & poets, collectors & connoisseurs to enjoy the Toy Stories: Paintings by Aaron Pickens exhibit and engage with the artwork in an ekphrastic “Mad Libs”-style interactive arts game. The free, open house event is a light-hearted and whimsical way to beat the winter blues, warm up the creative spirit and engage viewers with Toy Stories and the artwork in 20 North Gallery’s stable representation, all while looking deeply into the dual-nature of these imaginative tableaux. By combining the creative input of participants, the formal aspect of ekphrastic (or art-based) writing is sure to be completely upended to hilarious results! The arts activity will begin at 7 p.m. and will conclude at 8 p.m. Guests will have the opportunity for conversation with the artist before and following the arts activity. The event will feature light hors d’oeuvres and a cash bar by Venue. Free and open to the public. Click to view the Toy Stories exhibition catalogue, containing art images of the full exhibit, with artist info and commentary. 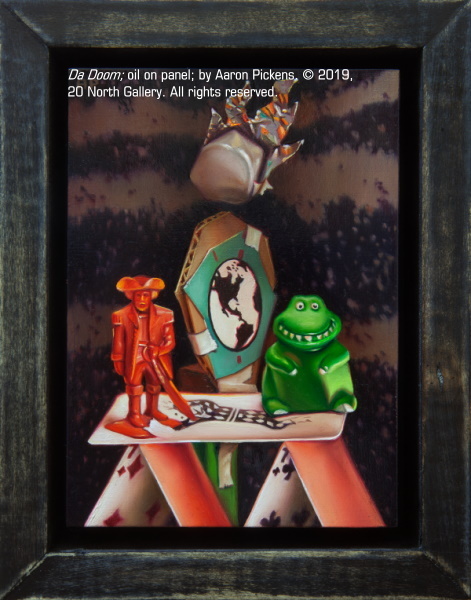 Bright and whimsical, arcane and nostalgic, meticulously composed and deeply symbolic, Pickens’ paintings of toy tableaux are dedicated observations that interpret the creative act of child’s play through the adult lens of consequence and social justice—sometimes nonsensical, sometimes disturbing and, somehow, always fun. The exhibit continues through March 30. Wednesday – Saturday, Noon – 4 p.m.